In this previous post, I discussed how all cyclists – whether supporters of helmet use or not – should take issue with Dr Michael Dinh’s recent article in Australian Cyclist which, amongst other things, painted cycling as a uniquely dangerous activity. Such rhetoric, I argued, does nothing except scare people off their bikes. However, there is more to Dr Dinh’s article than this; he links the fact that injured cyclists get brought into his hospital with the need, in his opinion, to maintain mandatory helmet laws. As I shall explain, this is a flawed conclusion – and it is not necessary to be sceptical of the effectiveness of helmets to appreciate this. It’s probably necessary to say right at the start that this article is not about bicycle helmets. Or more accurately, it’s not about the efficacy of cycle helmets. There is much impassioned debate about how well bicycle helmets work, and just how many head injuries they prevent – but this article does not venture into this territory. Indeed, for the purposes of reading this piece, it is useful to assume helmets ‘work’, in the sense that they prevent a sizeable percentage of potential head injuries in the event a cyclist is unlucky enough to strike his or her helmeted head. The point, though, is that just because something is effective at reducing injury does not mean its use should be mandatory. Long-handled BBQ tongs reduce the risk of receiving a burn, but that does not mean legislation is needed to criminalise the use of short tongs! This point may seem a trivialisation, but it is an important analogy. Cycling is a health-giving activity. People who cycle live longer than those who sit on the couch – even if you ride without a helmet. This is an important consideration; as a medical professional does Dr Dihn really feel that criminalising a behaviour that reduces the incidence of disease and premature death is the best approach to delivering improved health outcomes in Australia? People reading the magazine Dr Dinh’s article appeared in are, by definition, committed cyclists. To a committed cyclist, wearing a helmet is not an inconvenience. Indeed, many would do it irrespective of the law. However, many such committed cyclists fail to appreciate that, for most people, a bicycle is very ‘take it or leave it’ option. When mandatory helmet legislation was introduced, around 40% of people stopped using their bikes; these were not the committed cyclists (who were by and large already wearing helmets), but the occasional ‘pop down to the shops’ bicycle users. It is only when bicycle programmes that are expressly aimed at non-cyclists – such as bike-share schemes – are introduced that we see the issue anew when for example comparing ridership numbers for Melbourne’s bike share with almost any other international deployment you care to look at. This argument sometimes get dismissed as either whining or aggrandisement, but it is an important principle. Our entire societal fabric is built on the presumption of personal freedom; that we are able to pursue the goals and activities we value in the manner in which we wish to pursue them. Curtailment of those freedoms can only be justified where the execution of them impinges on the lives of others. For example, smoking (a very dangerous activity that kills around forty people every day in Australia) is legal, yet there are significant curtailments on smoking in public places because this exposes others to something unpleasant and harmful that they would not otherwise choose to be exposed to. Any argument about mandatory cycle helmets needs to address this issue; essentially it is necessary to show that not wearing a helmet places an unacceptable burden on (or limits the freedoms of) others – something that Dr Dinh does not even attempt to address. There are other arguments that I could make, but the point is clear. Several different arguments in favour of mandatory helmet legislation can be made, but simply claiming ‘it is necessary because helmets prevent injuries’ is not a valid one. There is an important debate to be had about mandatory helmet legislation but if Dr Dinh wants to further that debate he would do well to present better reasoned arguments that do not immediately fall flat on their face because they contain a basic logical fallacy. As it is, his article does nothing to support mandatory helmet laws, however much he might claim that it does – and this should be something that is clear to everyone irrespective of their views on helmets. And something else that all cyclists should agree on is that we desperately need a higher standard of debate on this important topic, especially from those that purport to speak from a position of authority. Read part three of this article here. In case you didn’t realise it, Arnott’s have a Scottish heritage. 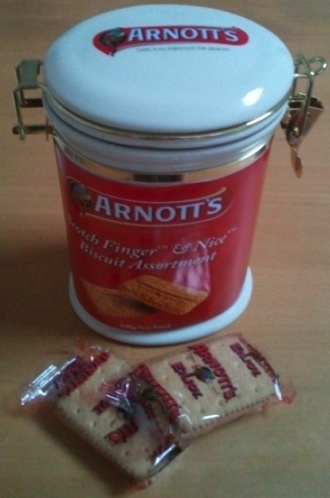 Old Mr Arnott was a immigrant from Scotland who opened his first bakery in Australia in 1865, to provide pies and biscuits to the people of Newcastle, New South Wales. This Scottish link is still very evident in the number of shortbread lines Arnott’s make – no less than five (Scotch Finger, Chocolate Scotch Finger, Shortbread Cream, Glengarry, and the Arno Shortbread). There’s a kind of pecking order with these biscuits that relates to the amount of butter used in the recipe. At the bottom of the pile in this respect is the Shortbread Cream, with not much butter at all (but the cream tries to make up for that). Then comes the iconic Scotch Finger, with some butter. Next is the Arno Shortbread, which has quite a lot of butter, but also still contains some vegetable oil. And finally at the top of the heap is the Glengarry, which is made only with butter. The A rno Shortbread, then, is pitched towards the premium end of the market. So how does it compare to the iconic (and much cheaper) Scotch Finger? Well, it is much crumblier, and evidently cooked to a higher bake. It has a bobbly raised surface that looks quite attractive. And it does have a quite distinct buttery taste; it doesn’t quite transport you to a windswept heathery moor replete with loner piper, but it is a tasty biscuit. The high bake means it doesn’t dunk terrifically well (this job is best left to the Scotch Finger), but it does make a nice change. However, I do wonder about this biscuit. It’s kind of one of those orphan lines that kind of isn’t anything. It’s not a Scotch Finger, delivering the goods every day. And it’s not a Glengarry, catering to the premium end of the market. It just feels a bit unnecessary. I suspect consumers feel the same, as it was definitely the case that this line was not moving very fast in my local supermarket, as evidenced by the outdated ‘simple goodness’ tag (this was updated to ‘Natural Ingredients’ some months ago, and this was the only line in the store for which the new packaging apparently had not filtered through). Not, of course, that I would suggest that Arnott’s cull this line. Oh no, we love the plethora of varieties in the Arnott’s stable. In fact, I suggest you go out and buy some Arno Shortbread immediately, to keep the sales up and help preserve this biscuit! I’d give this a seven-and-a-half out of ten. 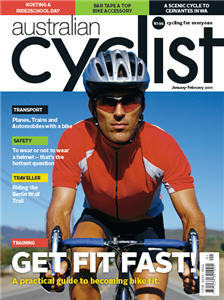 T he helmet debate rages on in the pages of Australian Cyclist. In the latest edition, Dr Michael Dinh makes the case that mandatory helmet laws are a good thing by describing some of the injuries received by cyclists. However, irrespective of their views on helmets, all cyclists should condemn this kind of rhetoric as being irresponsible and anti-cycling, as I shall explain. In the recent edition of ‘Australian Cyclist’ magazine, Dr Michael Dinh describes a cyclist brought into his hospital’s emergency department. He pulls no emotional punches, describing the team put on standby to save the mans life; we have vivid descriptions of his head injuries. And – shock horror – it turns out he wasn’t wearing a helmet! Describing this unlucky cyclist as ‘one of the lucky ones’, later in the article, Dr Dinh discusses another cyclist brought in – graphic descriptions of the team performing CPR on him are included, as well as descriptions of his ‘smashed helmet strewn all over the road’ and his ‘major chest, abdominal and head injuries’. This patient, it seems, died. This kind of writing is completely irresponsible, and can only be seen as a deliberate attempt to mislead; to attempt to paint a picture of cycling as some kind of extreme sport where death and injury lurks with each pedal stroke. Just getting on a bicycle, it seems, is risking life and limb. 1) Very few of the road accident victims Dr Dinh sees are cyclists. Australian road safety statistics show that cyclists represent only about 2% of accident victims. The overwhelming majority of them are, in fact, car occupants. For every injured cyclist that Dr Dinh sees, he sees twelve injured pedestrians and about forty injured motorists or car passengers. I wonder if Dr Dinh writes articles in ‘Jogging Monthly’ describing in similar emotional terms the terrible head injuries received by pedestrians? Or writes in the NRMA magazine about the carnage he sees when injured motorists are brought in? I suspect not; so in singling out cycling he is clearly trying to make it seem much more dangerous than it really is. Further statistics from Australia show that, on a ‘per trip’ basis, the injury rate for pedestrians is about the same as for cyclists. If you need to go to the shops; you’re actually less likely to be injured riding a bike as walking. (This changes somewhat if you consider it ‘per hour’ or ‘per kilometer’, but the point is still valid; the two activites are comparable in risk terms). Of course Dr Dinh is going to see terrible injuries; that’s the nature of working in a hospital emergency department. But why he chooses to paint cycling as so uniquely dangerous is unclear. Cycling is health-giving activity. More so, in fact, that going to the gym or doing sport. There have been many studies that show that people who ride bicycles on average live longer than non-cyclists. Whilst Dr Dinh does acknowledge the health benefits of cycling, he fails to point out that it more than offsets the risk of riding. In blunt terms, sitting on the couch is more dangerous that cycling. Dr Dinh makes the point in his article that cyclist admissions to his emergency department increased by around 200% over the last five years. A troubling statistic when presented without context; however when one realises that cycling participation levels have risen by about the same amount over the same period this data suddenly looks much less sinister and indeed could be expected. And here is the clincher. This very fact was alluded to by Omar Khalifa, the CEO of Bicycle NSW in his editorial in the same magazine. ‘The number one obstacle to getting more people on bikes is that they just don’t feel safe’ he writes. And after reading articles like Dr Dinh’s, is it any wonder? To paint such a lopsided picture of the dangers of cycling; to fail to give proper context for the risk and instead play on the readers emotions and giving the entirely erroneous impression that getting on a bike will almost certainly result in being seriously injured is hugely irresponsible. It turns people off cycling; it feeds the perception that cycling is terribly dangerous and reduces the number of cyclists on our roads. All cyclists, whether supporters of helmet laws or not, should reject this kind of rhetoric and insist that professionals such as doctors, who are in positions of great responsibility, stick to the facts rather than pandering to popular fears. Articles such as this add nothing to the debate, and simply act as very effective pieces of anti-cycling propoganda. Well, it finally happened. I guess it was inevitable. Riding to work last week I given a ticket by the cops for not wearing a helmet. They were waiting at the foot of the steps at the north end of the Sydney Harbour Bridge, handing out tickets to any cyclist not wearing a helmet. And there were a lot of them – just while I was there they nabbed another three renegade cyclists who dared to take to the streets on a bicycle without wearing a polystyrene hat. This just seems to me a complete waste of police resources, and I daresay the cops on duty felt the same way. However, their local area command had decided to have a ‘crackdown’ on scofflaw cyclists, so there they were. He listened somewhat sympathetically, but without disputing any of my points said he was there to uphold the law, and therefore he had to give me a ticket. Fair enough. I was of course very polite; funnily enough whilst I was talking to the officer another (helmeted) cyclist came by and started shouting at the police for being so stupid, and that what they were doing was ‘incredibly bad PR’. I’m less worried about the police’s image than about the many cyclists who, having been given a ticket that morning, will now give up on cycling. This is a great pity for lots of reasons; however one of the most ironic is that fewer cyclists means cycling is more dangerous for those that remain (due to the ‘safety in numbers’ effect). Such is the effect of our ridiculous and misguided helmet laws. The cops were there again the following week; however on this occasion a kind (helmeted) cyclist coming the other way cross the bridge warned me before I got there. I did consider continuing and getting another ticket (civil disobedience can be, after all, a noble thing). 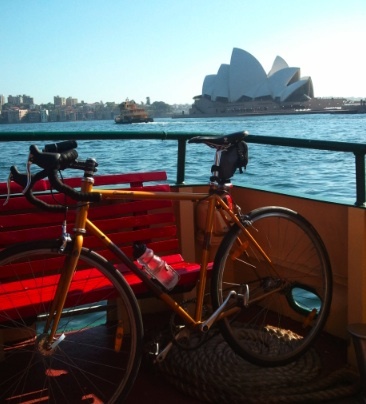 However, on balance I decided I could do without the hassle, so turned back and instead caught the ferry across the harbour – hence the picture. This made for a nice change, although the police had gone by the time I rode past. Honey Jumbles come in a rather unprepossessing pack. They are decked out in the blue packaging that Arnott’s use for ‘novelty’ biscuits, and the lurid pink icing tends to reinforce this notion. The cartoon bees also don’t do much to promote these as a grown-up biscuit worthy of serious consideration. 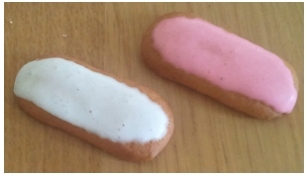 The biscuits themselves are quite thick (a full 12mm at the thickest point), and are variously topped with white or pink icing that is splodged on fairly roughly. There are twelve biscuits in a pack, and in the review pack there were only three white ones. The other nine were pink. So what do you expect when you eat a Honey Jumble? I for one was expecting a very sweet biscuit, probably crunchy perhaps with honeycomb or hokey pokey pieces ‘jumbled’ inside. If you’ve never tried a Honey Jumble, perhaps you should stop reading now, as eating your first Honey Jumble is an interesting experience if you come at it from that perspective. I took a bite, and the first thing I thought was ‘it’s soft‘. They are very soft – more cake-like than biscuit. All very strange. And then the flavour. It’s not honey, no no, something else. Ginger. Yes, definitely ginger. Actually quite strong; goodness these are really quite hot and gingery! Then it suddenly hits you. They are gingerbread. Actually rather nice gingerbread; soft texture, light and open, with a good ginger kick. It just takes rather a long time to get to that realisation, because you expect something so different. It’s a bit like eating a piece of parsnip that you mistake for potato when you put it on your fork. It just tastes wrong for a few seconds until you work out what it really is. Why on earth Arnott’s call these things ‘Honey Jumbles’ I have no idea. They certainly have honey in them, but it’s far from the dominant flavour. And the whole ‘jumble’ thing is just a bit odd. They should call them ‘Ginger fancies’, or perhaps even more to the point, ‘Gingerbread fingers’. Ditch the pink icing (which tastes the same as the white, by the way), put them in more sophisticated packaging and present them as upmarket continental treats, and I’m sure they would sell better. They could even go the whole hog and call them ‘Pain d’épices‘ (although this might cause confusion, looking to Australians more like some sort of orthopaedic complaint than a sweatmeat). I rather like Honey Jumbles. They are a sophisticated treat. Don’t be put off by the packaging and the name; when you fancy some gingerbread they are just the ticket. I’m going to give these eight out of ten, but deduct a mark for having a silly name. I decided to sell the wife over Christmas. It call came about because my head was turned; I was led astray by a newer, sexier model. Yes, I was browsing around a bike shop before Christmas and I saw the Kona Sutra. It was love at first sight. I admired the sloping top tube, the sturdy lines, the disc brakes. A true touring bike, itching for an adventure. And I wanted one. I really wanted one. I then spent some time thinking. The wife is pretty much a touring bike. She has a study rack, and takes panniers. And with a ten month old baby, I’m hardly likely to be heading off into the hills for an adventure any time soon. But I realy want a new bike. Perhaps not the Sutra, but something. I now have the Peugeot back in good shape for ‘road’ cycling (what ever that is), and have the Radish for grocery getting, so the wife only really gets used when I need to take stuff into work. I came to my conclusion. I wanted a divorce. 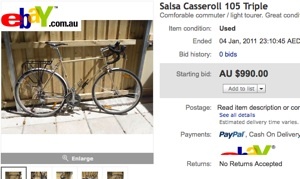 For whatever reason, the Casseroll triple wasn’t doing it for me; I wanted a new bike and something had to go to make room. We’d had a lot of good times together, enjoyed it while it lasted, but it was time to move on. Accordingly, I put her up for auction on eBay. For a great price (or so I thought). The days ticked by and there were no bids. I got a lot of watchers, though. ‘A-ha!’ I thought. Evidently seasoned eBay snipers wre out in force to snaffle a bargain at the last moment. The auction entered its final minutes. Still nothing. The final minute. Goodness, these snipers really do leave it late! The final few seconds – come on! And then it was over. Zero bids. The wife was unsold. Wrong price? Wrong time of year? Wrong description? Who knows. But the itch is still there, so sometime soon I need to find someone who will take her on, love, cherish and ride her. If that person could be you, please let me know! I finally got around to eating some of the biscuits I got for Christmas. Arnott’s do a range of seasonal packaging for the festive period, and this year I was lucky enough to score this handsome porcelain jar. It contains several individual packets of the Scotch Finger / Nice combination, so as well as getting a nice jar you can also pretend you are staying in a hotel by putting a packet by the side of your bed each night. The main label around the jar is simply a paper wrapper, so this can be removed, which I’m sure will make the jar even more attractive. I would say that I will then use it to store my unfinished packets of biscuits in, but having an unfinished packet of biscuits is such a rarity I doubt it will get used much. The other biscuit I got was a packet of Tim Tam Fingers. 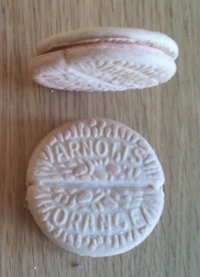 These are the same as Tim Tam Originals, but made long and thin and sold in a snack pack containing two fingers. Sometimes a change in form factor can make a biscuit taste different; something to do with varying proportions of chocolate coating and the like. However, in this case I can report that Tim Tam Fingers taste exactly like Tim Tam Originals. For a moment I did entertain the thought that the ‘Tim Tam Slam’ would be considerably more difficult given the extra length of these biscuits, and was tempted to give it a try. However, I actually think that the Tim Tam Slam is a waste of both good tea and a good biscuit, so I decided against it. Perhaps someone who has tried it could share their experiences via the ‘comments’ section below. Not just one wafer. Not just two wafers. No, as the name suggests with the Triple Wafer you get three different wafers in the same pack. Crazy! They come in cocoa, strawberry-ish and plain flavours, and, as is traditional with wafer biscuits, the strawberry-ish one is coloured lurid pink. The tag line on the pack is ‘Wafers… Enjoy The Moment’. It’s a very apt tagline, as these biscuits have an extraordinary quality. When you attempt to eat them, they disappear. Like something from Hogwarts they just vanish in the mouth the instant you bite into them. It really is a brief moment that you get with your wafer. Of the three, the plain one is the best. Just before it vanishes there is enough time to taste the wafery wafer and the cream filling; it’s all rather evocative of an ice-cream when on holiday. The cocoa ones are next best; they do taste quite clearly of cocoa, and I can imagine that many people would prefer them to the plain ones. (Such uneducated palates.) Finally, the strawberry-ish ones taste strawberry-ish; that is to say they taste nothing like strawberries at all. They just taste pink. Because they vanish as you eat them, you can get through a lot of these in one sitting. However, they are a bit sickly, so beware. As you get to about three-quarters of the way through the packet they do a kind of re-appearing trick in your stomach, and you suddenly feel rather bloated and queasy. You have been warned. It sounds like I really dislike these biscuits, but that’s not actually the case. They are exactly what you expect a wafer biscuit to be; it’s just that I’m not very keen on wafer biscuits (unless they contain chewy caramel layers, of course). 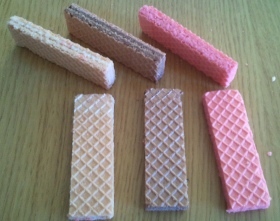 Indeed, as an example of the wafer biscuit genre, these are probably on the superior side. I’m going to give them a five out of ten because that’s what they objectively deserve, but if I allowed myself to put my wafer prejudices on view, I’d only give them a three. This Christmas, I asked Santa for a bubble machine. I had obviously been a good boy, as he obliged, and I was the proud recipient of an Early Learning Centre bubble-o-matic, compete with batteries and a large bottle of bubble mixture. A quick test showed that it was capable of producing a large volume of bubbles, much to the delight of Baby Chillikebab, and the even greater delight of her father. A little ingenuity was needed to mount the rather smooth, rounded machine to the back of the Radish, but once a bubble-machine mounting accessory was improvised I was ready for my first bubble-ride! The idea of riding along, leaving a trail of bubbles in my wake is a charming one*, but I cannot claim credit for the original idea. 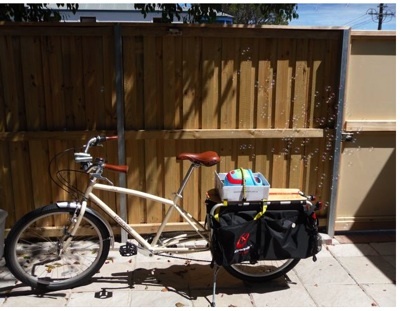 It was actually suggested to me by a friend who had in seen someone riding a bike in Pyrmont with a bubble machine attached. Whoever this nameless cyclist is, I take my hat (helmet?!!) off to them, and duly acknowledge their originality and wit. So what is bubble-riding like? Well, it’s lots of fun, and certainly gets you some attention. Almost as soon as I set off, someone waiting at the bus stop at the end of my street called out ‘That is awesome!’, and rushed to find his friend to point it out. Pedestrians and motorists smiled as I went past. Children especially seemed quite entranced. My mission was to spread joy and happiness, and I think I probably succeeded. The machine seemed to go into overdrive whilst queuing to get out of the fish markets; a massive cloud of bubbles just filled the intersection, giving a fun, human dimension to a bleak landscape of elevated motorways, traffic lanes and concrete. 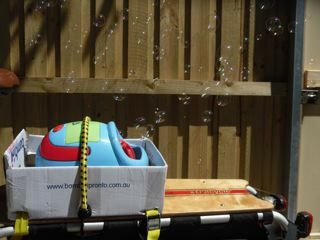 I did have a few technical issues with the bubble machine, which is clearly not designed for portable operation. The bubble mixture has a tendency to slop out of the machine; this is a particular problem when it slops out of the back, and into the fan mechanism. The fan blades quickly create a large amount of foam, which blocks the air intake and strains the motor. This significantly reduces or even stops bubble production. The machine also works less well where it is windy. So my advice for anyone wanting to try this for themselves would be to not put too much mixture in the machine (just take more with you and refill as you go), do your bubble-riding on a calm day, and try and ride smoothly, keeping the bike upright. Those minor issues aside, I was very pleased with my bubble-riding experiences. Whilst I haven’t yet done any peak-time bubble-riding, my sense is that it does make people smile, and perhaps might reduce the incidence of motoring aggression. As a way of making yourself conspicuous, it probably beats wearing flouro! What I’d now like to do is recruit a small army of bubble-riders, and take to the streets en-masse. Now what a sight that would be! The assorted cream selection pack consists of the Monte Carlo, Shortbread Cream, Kingston, Delta Creams and Orange Slice. 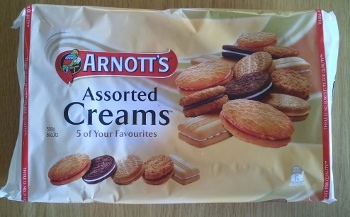 ‘Five of your favourites’, as the pack proclaims, although I’m less sure. The Delta Cream, for example, isn’t a great biscuit. The Lemon Crisp would be a much more worthy contender; however I suspect that its lemony goodness might taint the other biscuits in the pack. Such are the difficulties of putting together a selection like this. The real excitement of a selection is, of course, the ability to move from biscuit to biscuit as fancy takes you. It always feels a bit rude to not sample at least one of each biscuit at each sitting, but this is somewhat complicated by the fact there are a different number of each in the pack. There are a full eight Shortbread Creams, for example, but only four Kingstons. I’d like to think this imbalance is the result of endless research into the optimal ratios for maximum satisfaction, but I have a sneaking suspicion it’s to do with the fact that Kingstons are more expensive to manufacture. As Orange Slices are the only biscuit not already covered elsewhere, I thought it would be worthwhile taking a good look at this biscuit. I am assured that you can buy whole packets of Orange Slices, although I’ve never seen them anywhere. In any case, who would buy a whole pack of them? For some reason a biscuit called ‘Orange Slice’ just starts out behind the eight ball. It’s a bit like the coffee creme in a chocolate selection; you just have this gut feeling that it’s going to be a disappointment. There is supporting evidence for this too, as in general it’s the Orange Slices that are left at the end of the Assorted Creams. The Kingsons are the first to go, then the Monte Carlos and the Shortbread Creams. Sometimes a solitary Delta is left until the end, but usually it’s the poor Orange Slice that has to endure this ignominy. Indeed, I’ve even seem packs where all five of the Orange Slices have been left when all the other biscuits have been finished. The biscuits are patterned with an elaborate design which hints at orange blossom and ripe fruit; it also has a dividing line that looks a little as if the biscuit is designed to be divided into two and shared. This is a purely decorative effect, however, and indeed the dividing lines on either side of the biscuit do not line up. Needless to say any attempt to break an Orange Slice in two will result in a lot of crumbs and several uneven pieces. So what is the Orange Slice like? Well, the biscuit has quite a high bake making it a bit harder then you expect (this is also what makes it impossible to break neatly in half). It actually crunches quite satisfactorily to the bite, and is more substantial in terms of mouth-feel than you might expect. The orange-flavoured filling is quite tangy, and not too sweet. It does have a slight hint of that strange ‘dirty’ taste that for some reason seems to bedevil orange flavoured confections, but it’s not at all pronounced and only a minor fault. For the most part the tangy orange flavours come through quite nicely. In summary, the Orange Slice is a much nicer biscuit than you expect. It’s like the slightly geeky looking guy at the party that you try to avoid, but when you get to know is actually rather good company, but just a bit shy. So next time there is a pack of Assorted Creams on offer, why not jump straight on in there and go for the Orange Slice? You might be pleasantly surprised. I’m going to give this a seven-and-a-half out of ten.